PrimeStaff is regularly providing expert commentary to the media. News media representatives can reach a PrimeStaff’s spokesperson by email at pr@primestaff.com.sg or call (65) 6222 3310. We’ll be pleased to contribute facts, comments and articles. 28-August-17 The Business Times Will tax hit the sweet spot? 31-July-17 The Business Times Up, up and away? 24-Jun-14 Singapore Business Review When is it time to fire someone? 16-Apr-14 Singapore Business Review Lousy customer service: Who’s to blame? 10-Mar-14 The Business Times Higher CPF rates for older workers: boon or bane? 14-Feb-14 Singapore Business Review HR after Anton Casey: Is a formal social media policy necessary? 20-Jan-14 The Business Times Time to relax property measures? 03-Dec-12 The Business Times What does 2013 holds? 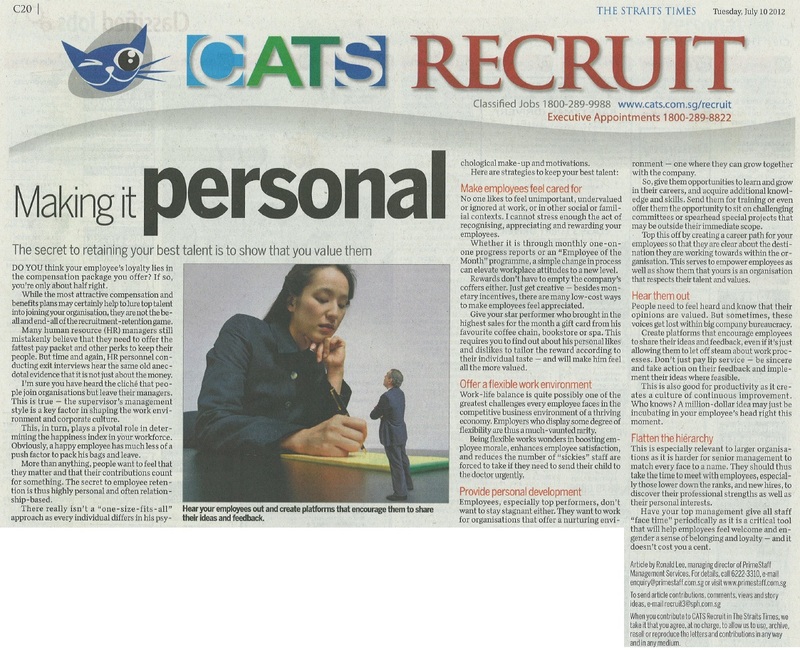 28-Nov-12 The Straits Times Recruit Who’s hiring? 12-Sep-11 Business Times What have we learnt? 04-Jun-11 News 5 Tonight Huge wage growth this year?